Sometimes you just want something simple. I really like things simple – perhaps a result of the strange complexities and turmoil that my life tends to attract. Simplicity is therefore something I crave and prize but alas, due to my drama queen tendencies, not something that I achieve on a daily basis. This probably reflects on my food. I wish I had the élan and confidence of a Thomas Keller (and talent, skill and even one iota of his genius) to discover the true nature of an ingredient and highlight and “stage” it so simply yet profoundly that the taste buds are forever transformed. Instead, I tend to over-do and over-analyse my approach to cooking. How that could have happened on my grandmother’s watch (a formidable woman in and out of the kitchen) is still a mystery to me … and probably to her. I believe we cook as we live our lives. Similar to how I may try too hard in the kitchen, I am sadly the same in life. I throw myself into things and expend all that I have and am into everything. Work, relationships, hobbies, endeavours … it’s all or nothing. I cannot seem to find a middle ground or balance. I either do it and do it with a passion … or not at all. Some may think this is admirable but it’s really not. The flip side is that you basically tire yourself (and everyone) out by such flagrant exertion. Also, because you invest so much, you are prone to extremely high expectations – from yourself and others. And typically, this sets you up for supreme disappointment. In recent months, I have been deeply disappointed and disillusioned by a few people I considered friends … in fact, close friends. Being a bit of a passive-aggressive individual, I chose the path of least resistance. With the strong belief that you cannot change people and frankly, it is not your place to try, I decided to shut these people out instead of confronting them on why and how they have betrayed my friendship and trust. Yes, it is cowardly of me but it would have been a pointless pursuit. I may be slow but not always stupid. OK, maybe only on Mondays, Wednesdays and Fridays. And occasionally Sundays. To seek a confrontation with them would require some desire to reclaim the misplaced trust and affection. I simply did not have it. Not anymore at any rate. Not generally an unforgiving sort and in fact, ridiculously forgiving to the extent of stupidity, I am however frighteningly resolute and unyielding when the line has been crossed beyond what is bearable. And I have never turned back from a decision, no matter how painful. Such was the scenario today when a particularly fair weather friend called all blithe and cheery after months of conspicuous silence. Perhaps the PMS (bet you could not tell, eh?) that I was suffering under made me even more distant and remote than usual. Usually, I can feign some level of interest and goodwill even when I think the person I am talking to is the scum of the earth. But not today when I am in pain. It was not a complete lie. I was not feeling my usual skippy self (and a bunch of Aussies are laughing at the visual of me looking brown and with a pouch). I needed comfort food. But comfort food that was fast and simple. After yesterday’s indulgent affair, I needed a clean palette with fresh, healthy overtones. I decided to make one of my favourite dishes. It’s never failed to make me feel better and is fabulously healthy yet so tasty that it is almost a crime how easy and fast it is to make. An ultimate comfort dish, you say? I bet you are wondering if this is a prized family recipe for macaroni and cheese. Or a heartwarming curry. Or a rich stew. No, my friend. 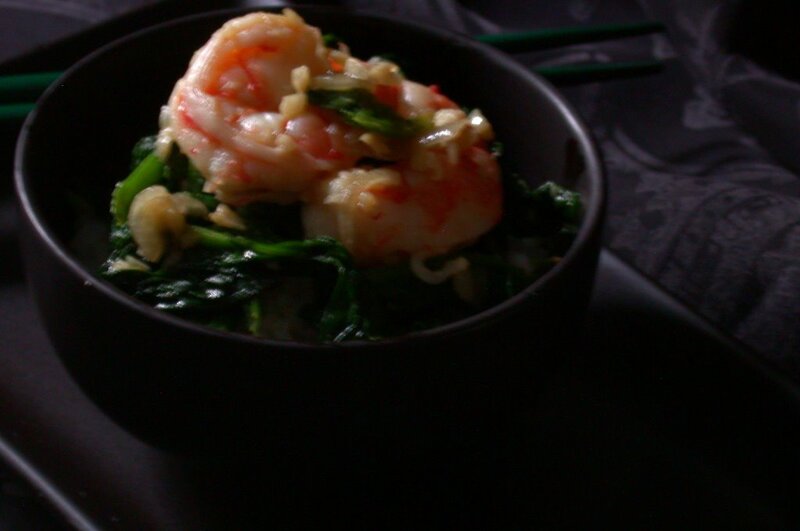 It is a prawns and spinach dish. Many would be surprised to discover that, despite my love of creams, spices and unctuous food, my ultimate comfort dish is actually a dish so healthy that even Oprah would approve. Yeah, I like keeping people on their toes. On pointé! This recipe is for one very hungry person or two small eaters. I was one hungry person today as I missed lunch. 1. 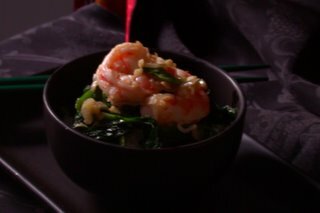 Heat the wok or pan and fry the prawns shells in a little oil till fragrant, adding a little water. Fry for about 1-2 minutes and then pressing hard on the shells to drain the stock out as much possible, remove these leaving only a little liquid in the wok. Set the shells aside to make stock (I usually stockpile a bunch so I can make a very fragrant prawn stock for soups). 2. Add the rest of the oil and sauté the garlic and onions till the fragrant - and trust me, it will be fragrant! Someone I taught this dish to asked me an intelligent question once. And only once. After that she reverted to her Jessica Simpson routine. This girl actually told me that she never eats seafood while scoffing a tuna and mayo sandwich. Why the sugar? 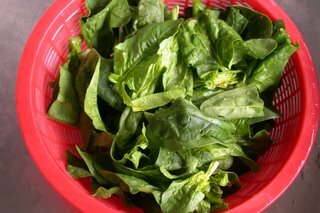 Because it will coax the additional sweetness of the prawns and counter that slight iron taste of the spinach. But go easy on it as it is just a catalyst and not the main seasoning. I love this dish. It is so simple and fast. Yet so incredibly delicious. Eating it comforts me immediately with the additional benefit of making me feel virtuous for eating so healthily. And now to take a rest since I was not totally fibbing about being a little under the weather. I can so relate to what you've written above and have acted the same. Thanks so much, J! After a good night's sleep I do feel so much better. Gong Xi Fatt Cai to you! Paz - this dish is one where I would make for myself instead of with company. Only because I don't want to share! LOL! You know, you can also make this with the microwave? When I was in an apt with no stove (I know! HOw can that be?? ), I still managed to whip this dish up with the microwave. I can't imagine an apartment with a stove/oven. Cooking with the microwave. Cool! I'm impressed!